It's always about the angels and the demons, isn't it? Why can't they just get along for a change? In Witchblade, that unrelenting struggle takes the form of the Angelus and the Darkness, two extreme variations of the same color, with Sara Pezzini's Witchblade straddling the line between the two. Constantly in search of some sort of eternal balance, Sara's role has changed quite a bit over the years. For one, the Witchblade itself has divided and sought out a second master, Danielle Baptiste, and (surprise surprise) the two don't get along. Having finally come to blows, both women managed to escape with their lives but the rift between them has grown wider. Now Sara's blade is beginning to lean toward the darkness, while Danielle's embraces the light. For all the pomp and circumstance proposed by his plot, Ron Marz takes an absurdly casual approach to writing this issue. When Sara transforms the Brooklyn bridge into a gothic cathedral, complete with glowing green windows, Danielle reacts as though she's ordering a pizza. It's downright hilarious, the way so many absurd, fantastic situations are treated as though they were commonplace. Maybe the residents of this version of New York are accustomed to seeing armor-plated angels sail through the sky, four-foot long swords protruding from their forearms, but I certainly am not. When did this series completely lose its link to reality, and why does it flaunt that disconnection so proudly? Remember Spawn: The Impaler? A fully painted three-issue mini-series from the mid ‘90s, the height of McFarlane-mania, when Image was cashing in on the character's popularity with weak spinoffs and terrible movies? If not, thank your lucky stars. It was brutal: horribly written and essentially impossible to follow thanks to artwork that really had no business being painted. In either case, Stjephan Sejic's artwork in Witchblade #129 is its spiritual successor. It's so ugly it detracts from the story, which wasn't exactly the stuff of legend in the first place. Sejic's touch with the paintbrush is fine – he'd do well as a full time colorist – it's his compositions and stale underlying sketches that ruin the issue. Most characters look alike, if not identical, like rejects from an open audition for All My Children. The landscapes they occupy vary wildly from needless, excessive, distracting detail to lazy, half-assed afterthoughts. Sometimes he takes that leap more than once on a single page. Sejic can't settle on a paneling style, either, flying recklessly from a strict grid layout to a series of wild, arcing, jagged-edged trapezoids. He really doesn't seem to be ready for this kind of gig. 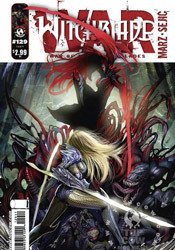 Witchblade #129 is a bundle of regurgitated concepts and weak execution. While it professes to be much more, Ron Marz's script is really just an excuse to jump into a fight scene. His cast speaks in a single dull, unified voice, without a single relatable character in the mix. And, despite delivering a small handful of surprisingly great single panels, the vast majority of Stjephan Sejic's artwork is similarly faceless and unfocused. Even if you have a long relationship with the series, this issue probably won't entertain you despite the meager plot twist at its conclusion. It makes plenty of noise, but in the end this is hauntingly shallow. Skip it.